When decorating boys rooms, remember to let out your own inner child. Be playful and imaginative. While your mind wanders, consider the practical dynamics of a bedroom and create a livable place too. The combination of whimsical and sensible transforms an ordinary space into an amazing kid's room. Children's bedrooms are their own personal refuges. From birth until they are off to college, it is the one part of your home that is truly theirs. An ideal kid's room should foster learning and fun, sleep and play, and expand their imagination. A bedroom is a multi-use zone with space needed for work, play with friends, and sleep. Be sure to also manage storage space to contain the inherent clutter that young people create. Research has proven that children function best in an environment that is familiar and organized. Reach to maximize this concept in the space they use most… their bedroom. If your child is old enough, always include them in the decorating process. Encourage them to create realistic themes and help chose the paint colors. Even a three to four year old can select basic colors. Present them with familiar objects such as crayons in about six colors and have them pick their favorites. Providing them a sense of ownership over the process encourages excitement and discourages resistance. Start by looking at the big picture of the room. Then move on to the smaller details. Focusing on the concept of a bedroom as a place of security, find the coziest corner and begin there. Next layout the larger items, later adding in the decorations. Whether your child is still in utero or a rambunctious first grader, when decorating boys rooms, remember that as they grow their needs will change. A baby's room requires safety first with a low to ground focus. As a child grows into school age, his desires will greatly change. Discover the joys of convertible furniture and easy to replace decorations. These recent changes in the marketplace of children's room design help us all save money and time when decorating boys rooms. Changing tables that transform into dressers. Convertible cribs turn into toddler beds and even some into headboards for older kids. Fabric wall coverings to deaden sounds for a sleeping baby and later hide the sounds of a teenager's music. Closet kits create instant hidden storage without sacrificing floor space. 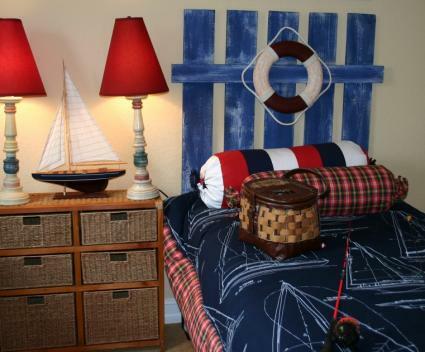 The following are simple ideas to spruce up a boy's space enabling him to capitalize on the uses of his bedroom. In a boy's room, wall art is an easy to create decoration that can change with your son's taste. Depending on your artistic skill, you can free-hand paint pictures, stencil designs, stick wall decals or paste wallpaper borders. Visit any craft store or home improvement warehouse for a wide range of themes and options. Add words along with the pictures on the wall. Whether it is something as simple as the child's name, a nursery rhyme or a bible passage, words on a wall are something to be remembered. You can't go wrong with dinosaurs. An often underutilized space for creativity is the ceiling. As children love to lie in bed and look up, the ceiling is an excellent place for inspiration. Paint designs, hang treasures, use glow in the dark paint to make a private star system, or simply attach posters/fabric art. Every room has some of its own natural character, just waiting to be discovered. Peruse the area for nooks, angles, built-ins or windows and exploit these. Create wall cut outs for character and storage. Design lofts, secret hideouts or sleep nooks, enhancing your boy's imagination. Shelves are truly the child decorator's best friends: they are a great way to store items and use them as decorations at the same time. Try high shelves, or even thick molding, to house colorful toys or collections, adding to the design and function of a boy's bedroom. Be creative in your placement of furniture and employ it to create zones within a boy's room. Paint and decorate the furniture itself incorporating it within the room's theme. Emphasize the bed in the room's design, as it is the one place your child is guaranteed to spend the most time. You can also find a wonderful assortment of kids' bedding to accent your son's bed. Collections and hobbies are key to a boy's life. Create a space to display, play and work on your child's hobbies and interests. Fireman - include a fire pole within the room design. Dinosaurs - a traditional favorite among young boys. Castle - create a drawbridge bed and dragons painted on the walls. World Traveler - decorate with globes, maps on the wall or ceiling, suitcases for storage and a mailbox. Schoolboy - place a large chalkboard on the wall, use a traditional school desk, hang a swing in the room. Vehicles - trains, planes, trucks, tractors, anything that goes vroom… boys love! Decorate with stop signs, road rugs, car shaped bed, airplane wing shelves, racing checkers. Under the Sea - create a submarine bed, sand pails for toys, blue walls with sea life art, bottom of boat on ceiling, bubbles and weathered wood furniture. Cowboy - try sheriff stars, rope as molding, horseshoe above door, saloon style closet doors, barn paint, bullhorns or a cow skin blanket. Sports - also another traditional favorite for boys of all ages. Place a basketball hoop on the wall; decorate with ball rugs and pillows, trophies, sports paraphernalia, baseball hats. Space - shoot for the moon and decorate with glow in the dark paint, telescopes, starts, planets, clouds or even design a rocket ship. Decorating boys rooms should be a fun and entertaining adventure… enjoy!